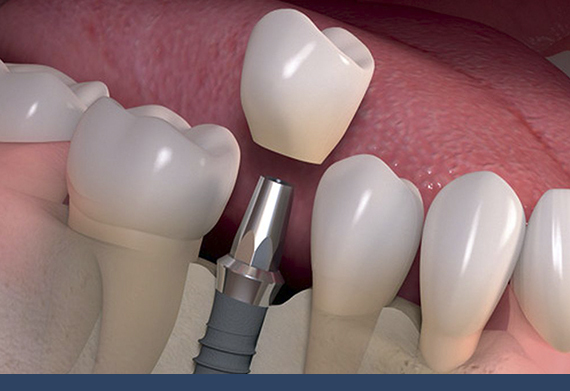 Oral implants are the ideal solution if you are missing teeth. Whether you are missing one tooth or several or all your teeth, this treatment is becoming the standard of care. Dental implants not only look and feel just like your natural teeth, but they also will provide the same level of functionality that you are used to. An im­plant-supported overdenture has the advantage of replacing a patient’s teeth with more lenient implant placement positions compared to the other alternative prosthetic choices. Are indicates when the patient have severe morphologic compromise of denture supporting areas that significantly undermine denture retention. Poor oral muscular coordination. Low tolerance of mucosal tissues. Parafunctional habits leading to recurrent soreness and instability of prosthesis. A fixed bridge on implants is a great permanent solution. The bridge is completely customized to each patient’s needs and situation. This implant supported bridge is non removable from the mouth by the patient. It is also palateless which means nothing will be covering the roof of your mouth. You can replace a full set of missing teeth with dental implants and a fixed bridge. The Hybrid Bar Overdenture is retrievable by the clinician and can be used to restore both complete and partially edentulous patients. Factors to consider when treatment planning your case are the patients’ arch form, size of implants, number and location of implants, as well as the available vertical dimension. A wax setup try-in is always advised to establish a reference for designing the underlying bar support. Experience Matters When it Comes to Dental Implants. training, and track record (oral surgeons in Mexico). Dr. Barrandey has extensive training and experience with both parts of dental implant treatment – the surgical placement of the implant and the restoring of the crown. She has over 10 years of experience successfully placing dental implants. Most patients don’t realize that implant dentistry is not a recognized specialty area within dentistry. This means that any dentist can legally do dental implants without any additional training beyond dental school. But to do these procedures correctly requires extensive post-graduate education. So when selecting an implant dentist, be sure to check out the dentist’s credentials, training, and track record (oral surgeons in Mexico). Dr. Barrandey has extensive training and experience with both parts of dental implant treatment – the surgical placement of the implant and the restoring of the crown. She has over 10 years of experience successfully placing dental implants. •They are a durable, permanent solution to replace missing teeth. •Chewing efficiency will not be reduced because implants function just like normal teeth. •No one will be able to detect that the implants aren’t your natural teeth. •Two, four, six, or eight dental implants can be placed in addition to a denture, and the implants will stabilize the denture. •For one or two missing teeth, using dental implants avoids needing to place crowns on adjacent teeth that may otherwise be healthy. Thus this is a more conservative treatment option. •The entire procedure can take up to six months. This is due to the healing process that must transpire before the crown is placed. •Dental implants are more expensive than some other tooth replacement options. So if you are considering dental implants, we will present all of your options and will work together with you to come up with the right treatment plan for your unique situation. •If you are missing a single tooth, and if the teeth on either side need crowns anyway, it may make more sense to do a bridge than to place a dental implant.